Wilfrid Laurier University’s most loyal and generous donors were celebrated at a special event hosted by Development and Alumni Relations on May 24. 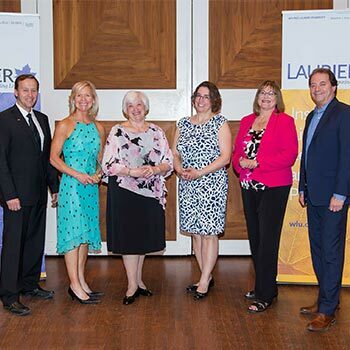 The annual Laurier Society Celebration recognizes the individuals, corporations and foundations that support Laurier in its mission to inspire lives of leadership and purpose. The evening included remarks from Laurier’s President and Vice-Chancellor, Max Blouw, and the Chair of the Board of Governors, John Bowey, as well as a performance by Safe as Houses, a local band featuring two students from Laurier’s Faculty of Music. A final highlight of the event was the presentation of the 2017 Laurier Society Philanthropy Awards. Recipients Roger and Edith Davis and their family were recognized for their long history of supporting their community—Brantford. Over the years, Roger and Edith have made several donations to the development of Laurier’s Brantford campus. Most recently, Roger and Edith committed a leadership gift to the Laurier Brantford YMCA, which will support the continued growth of the university and the broader health and prosperity of the community. The award was accepted by Edith and Roger’s son and daughter-in-law, Floyd and Kim Davis. Helen and Steve Kun also received the 2017 Laurier Society Philanthropy Award. Devoted supporters and champions of Laurier, Helen and Steve have a long and generous history in the City of Brantford and in support of Laurier’s Brantford campus. Ten years ago, they supported the construction of the “Steve and Helen Kun Lecture Hall” located in the Research and Academic Centre. In 2014, the long-time residents of Brantford, along with their family, provided a leadership gift to the Laurier Brantford YMCA. The award was accepted by Helen and Steve’s children: Richard Kun, Cathy Tuck and Helen Tindale. Marcia Powers-Dunlop (BA ’69, MSW ’76), also received the 2017 Laurier Society Philanthropy Award. An engaged and proud alumna, volunteer and one of Laurier’s 100 Alumni of Achievement, Marcia has generously supported Laurier since 1983. In particular, Marcia established the Powers-Dunlop Female Athletic Award to recognize female athletes and team managers. In addition to her continued annual support, Marcia is a legacy donor, supporting Laurier through a gift in her will. “This annual event is very important, as it provides Laurier the opportunity to personally thank and celebrate our remarkable community of donors. We know that the generosity of our donors – alumni, friends, students, staff, faculty, foundation and corporations – makes all the difference as their support enhances and expands the Laurier experience to make it truly exceptional,” said Gordon. This past year, 3,545 donors generously donated more than $8.7 million to help enhance and expand our university and the Laurier student experience. Photo: The 2017 Laurier Society Philanthropy award recipients were recognized, last night (listed from left to right): Edith and Roger Davis (accepted by Floyd and Kim Davis),Marcia Powers-Dunlop, and Helen and Steve Kun (accepted by Cathy Tuck, Helen Tindale and Richard Kun).